For the 2015 South Korean film, see Eyelids (film). "Palpebral" is not to be confused with "Palpable". An eyelid is a thin fold of skin that covers and protects the human eye. The levator palpebrae superioris muscle retracts the eyelid, exposing the cornea to the outside, giving vision. This can be either voluntarily or involuntarily. The human eyelid features a row of eyelashes along the eyelid margin, which serve to heighten the protection of the eye from dust and foreign debris, as well as from perspiration. "Palpebral" (and "blepharal") means relating to the eyelids. Its key function is to regularly spread the tears and other secretions on the eye surface to keep it moist, since the cornea must be continuously moist. They keep the eyes from drying out when asleep. Moreover, the blink reflex protects the eye from foreign bodies. The eyelid is made up of several layers; from superficial to deep, these are: skin, subcutaneous tissue, orbicularis oculi, orbital septum and tarsal plates, and palpebral conjunctiva. The meibomian glands lie within the eyelid and secrete the lipid part of the tear film. In humans, the eyelids are supplied with blood by two arches on each upper and lower lid. The arches are formed by anastomoses of the lateral palpebral arteries and medial palpebral arteries, branching off from the lacrimal artery and ophthalmic artery, respectively. The human eyelid features a row of eyelashes along the eyelid margin, which serve to heighten the protection of the eye from dust and foreign debris. Hordeolum (stye) is an infection of the sebaceous glands of Zeis usually caused by Staphylococcus aureus bacteria, similar to the more common condition Acne vulgaris. It is characterized by an acute onset of symptoms and it appears similar to a red bump placed underneath the eyelid. The main symptoms of styes include pain, redness of the eyelid and sometimes swollen eyelids. Styes usually disappear within a week without treatment. Otherwise, antibiotics may be prescribed and home remedies such as warm water compresses may be used to promote faster healing. Styes are normally harmless and do not cause long lasting damage. Demodex mites are a genus of tiny mites that live as commensals in and around the hair follicles of numerous mammals including humans, cats and dogs. Human demodex mites typically live in the follicles of the eyebrows and eyelashes. While normally harmless, human demodex mites can sometimes cause irritation of the skin (demodicosis) in persons with weakened immune systems. Entropion usually results from aging, but sometimes can be due to a congenital defect, a spastic eyelid muscle, or a scar on the inside of the lid that could be from surgery, injury, or disease. It is an asymptomatic condition that can, rarely, lead to trichiasis, which requires surgery. It mostly affects the lower lid, and is characterized by the turning inward of the lid, toward the globe. Ectropion is another aging-related eyelid condition that may lead to chronic eye irritation and scarring. It may also be the result of allergies and its main symptoms are pain, excessive tearing and hardening of the eyelid conjunctiva. Laxity is also another aging-related eyelid condition that can lead to dryness and irritation. Surgery may be necessary to repair the eyelid to its natural position. In certain instances, excessive lower lid laxity creates the Fornix of Reiss – a pocket between the lower eyelid and globe – which is the ideal location to administer topical ophthalmic medications. Eyelid edema is a condition in which the eyelids are swollen and tissues contain excess fluid. It may affect eye function when it increases the intraocular pressure. Eyelid edema is caused by allergy, trichiasis or infections. The main symptoms are swollen red eyelids, pain, and itching. Chronic eyelid edema can lead to blepharochalasis. Eyelid tumors may also occur. Basal cell carcinomas are the most frequently encountered kind of cancer affecting the eyelid, making up 85% to 95% of all malignant eyelid tumors. The tumors may be benign or malignant. Usually benign tumors are localized and removed before becoming a cancerous threat and before they become large enough to impair vision. Malignant tumors on the other hand tend to spread to surrounding areas and tissues. Eyelid dermatitis is the inflammation of the eyelid skin. It is mostly a result of allergies or contact dermatitis of the eyelid. Symptoms include dry and flaky skin on the eyelids and swollen eyelids. 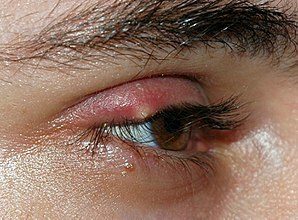 The affected eyelid may itch. Treatment consists in proper eye hygiene and avoiding the allergens that trigger the condition. In rare cases, topical creams may be used but only under a doctor's supervision. Ptosis (drooping eyelid) is when the upper eyelid droops or sags due to weakness or paralysis of the levator muscle (responsible for raising the eyelid), or due to damage to nerves controlling the muscle. It can be a manifestation of the normal aging process, a congenital condition, or due to an injury or disease. Risk factors related to ptosis include diabetes, stroke, Horner syndrome, Bell's Palsy (compression/damage to Facial nerve), myasthenia gravis, brain tumor or other cancers that can affect nerve or muscle function. Most of the cosmetic eyelid surgeries are aimed to enhance the look of the face and to boost self-confidence by restoring a youthful eyelid appearance. They are intended to remove fat and excess skin that may be found on the eyelids after a certain age. Eyelid surgeries are also performed to improve peripheral vision or to treat chalazion, eyelid tumors, ptosis, extropion, trichiasis, and other eyelid-related conditions. Blepharoplasty is a cosmetic surgical procedure performed to correct deformities and improve or modify the appearance of the eyelids. With 1.43 million people undergoing the procedure in 2014, blepharoplasty is the second most popular cosmetic procedure in the world (Botulinum toxin injection is first), and the most frequently performed cosmetic surgical procedure in the world. The procedure is particularly popular in East Asia, where it has been reported to be the most common aesthetic procedure in Taiwan and South Korea. Though the procedure is also used to reinforce muscle and tendon tissues surrounding the eye, the operative goal of East Asian blepharoplasty is to remove the adipose and linear tissues underneath and surrounding the eyelids in order to crease the upper eyelid. The use of double sided tape to create the illusion of creased, or "double" eyelids has become a prominent practice in China and other Asian countries. There is a social pressure for women to have this surgery, and also to use the alternative (taping) practices. Blepharoplasty has become a common surgical operation that is actively encouraged, whilst other kinds of plastic surgery are actively discouraged in Chinese culture. ^ a b Goldman, Lee. Goldman's Cecil Medicine (24th ed.). Philadelphia: Elsevier Saunders. p. 2426. ISBN 1437727883. ^ "eye, human." Encyclopædia Britannica. Encyclopædia Britannica Ultimate Reference Suite. Chicago: Encyclopædia Britannica, 2010. ^ "Facts About Blepharitis". Retrieved 30 March 2010. ^ "Eyelid Disorders". Retrieved 30 March 2010. ^ "Upper Eyelid Edema Treatment and Symptoms". Retrieved 30 March 2010. ^ "Eyelid and Orbital Tumors". Retrieved 30 March 2010. "Eyelid and Orbital Tumours". Retrieved 22 August 2014. ^ "Eyelid twitch". Retrieved 30 March 2010. ^ Liao WC, Tung TC, Tsai TR, Wang CY, Lin CH (2005). "Celebrity arcade suture blepharoplasty for double eyelid". Aesthetic Plastic Surgery. 29 (6): 540–5. doi:10.1007/s00266-005-0012-5. PMID 16237581.